Here are some photos from old workshops held by the guild. Please visit the new guild website at cvfg.org for information on upcoming programs, meetings, study groups and workshops. Come join us for our exciting May workshop! Participants provide their own lunch and beverage. Pictures and recording are allowed. Tatting is a handcrafting technique used to make simple yet beautiful lace. Tatted lace is used to embellish garments, collars, jewelry, holiday ornaments, home decorations, bridal presents and more! This is a shuttle tatting beginners class, each student will learn the basic stitches in the technique, foundation for larger projects: single and double knots, picots, joins, tatted rings and chains. At the end of the class each student will be able to create a beautiful tatted motif that can be used alone or as a foundation for larger projects. DMC Petra Crochet Cotton Thread Size 5. Email cvillefiberarts@gmail.com for additional information and to register to attend! Look at all of the fantastic fidget quilts the guild was able to donate to Our Lady of Peace this year! Thank you to all of the members that took the time to make a quilt (or two) towards the nearly two dozen we donated! In March 2015, Anne Breaud introduced us to a whole new world of bags! She gave us a demonstration program of making fabric bags appropriate for many uses and scalable in size. She provided handouts with step-by-step directions and patterns for several types of pocketed, lined, washable bags for all your carry-around projects. Throughout the demonstration, Anne also provided a wealth of general sewing tips and techniques. In February Margaret Radcliffe came to teach four knitting workshops. We learned all about how to finish our projects with ease and how to conquer those dreaded knitting disasters. Many were also excited to see how easily they could knit with multiple yarns through helix knitting. 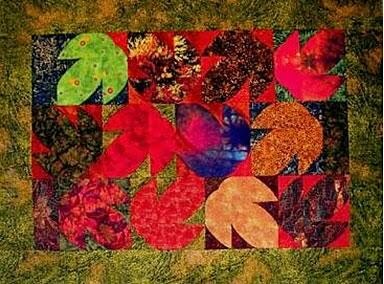 This month we had a workshop on quilting! 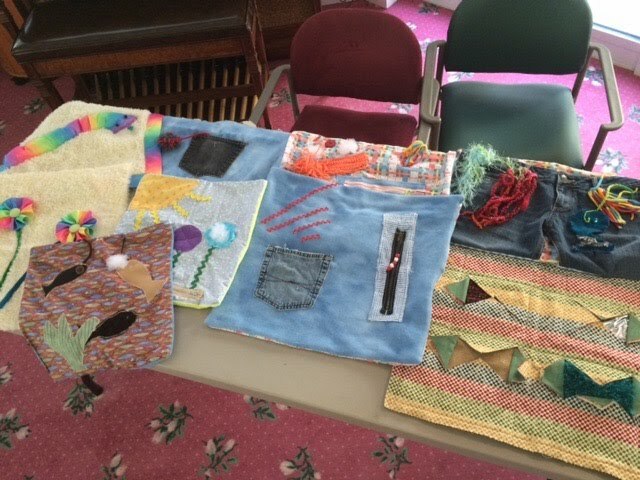 Valerie Wampler presented a quilt piecing workshop. Under her guidance and direction, participants used a clever technique to create curved-edge leaves from folded triangles and straight cuts. At our December meeting we had our annual potluck and ornament exchange! 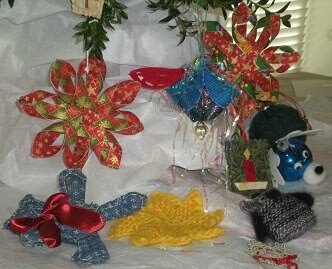 Look at all of the beautiful handmade ornaments! We had a great time at our September workshop. We visited Kid Hollow Farm and dyed our own skeins of yarn. A special thanks to Pat Harder for hosting and teaching us all about how she dyes her beautiful yarn! Next we added all of the color before putting the yarn in the oven! After a quick rinse and spin, our yarn is ready!